Far greater control of which source to get items from. It would enable the ability to setup the whole circuit network to control when and how to prioritize the logistics with robots. I would have the "read content"-button for all the networks. Sometimes you want to read the content to add it into the logistic network. All my train stations have a SR-Latch for activate/deactivate, whick read the content in the logistic network (they are dedicated on every trainstop). So Requesterchests don't send their content back into the network, and you can't use them for the station. Otherwise i can't use green f.e. in my smelter station, because steel also needs iron, and i want to priorize iron output to station right before the iron input for steel. but i also don't want to count the iron which is in the requesterchests/bufferchests for the steelproduction. c0bRa wrote: I would have the "read content"-button for all the networks. No it isn't in the logstics network without wiring. All but Requesterchests send their content back into the logistics network. Requesters doesn't. 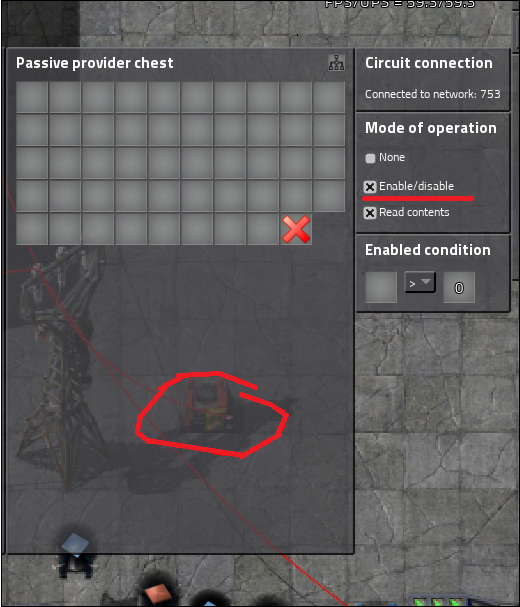 Just wanted to pump this idea... Another really nice use for this, would be Bot based Requestor Stations.. You can activate and deactive provider chests to achieve Provider chest balancing... Very similiar to the provider station balancing where you activate an inserter based on the average of all the items / divide by the number of chests.. There are other ways to do this, but this way would be self correcting..